The second part of Nanbaka. The prisoners and their guards continue their comfortable lives at Nanba Prison. However, from the shadows emerges a new threat: Enki Gokuu, a person from Samon's past, who has mysterious goals of his own. Other: Nanbaka: Shusseki Bangou no Tsuita Baka-tachi! 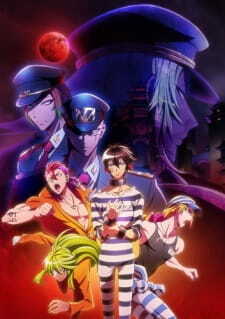 Nanbaka's second season starts off with an episode that restates a certain quote and reinforces the meaning of this quote multiple times during the episode - "Nanbaka is a gag anime", Nanbaka has always been at its best when it's portraying the daily lives of our eccentric innmates and guards of Building 13 in all their fun, frolic, heavily contrasted colors, sparkles and comedic glory. The occasional appearance of characters from other buildings adds some nice diversity to the regular formula delivering an overall fun and enjoyable experience. After a first episode that seemed to draw focus to the show's best element, it felt as though the show was signifying a return to it's roots as gag anime and this most certainly felt like good news to me. After the serious action oriented episodes of the middle half of the first season, this focus on comedy was exactly what I felt the series needed. Unfortunately, as it turns out, the second season of Nanbaka is far more serious and action-oriented than the first season ever was. Of course I'm not saying that the action is Nanbaka is bad, in fact the action scenes are actually really cool at times and are pretty enjoyable to watch. Though sometimes, this seriousness and over the top superpowers that do not in the least seem anywhere near believable given the setting and nature of the show can require some immense suspension of disbelief. The weird thing is, the shift to a serious tone is in a sense what allows the comedic episodes that follow post the seriousness to be so effective, this is especially true when you take note of the last 3 episodes of the first season which were both really funny and even heartwarming. Ultimately, this comedy-serious-comedy structure of Nanbaka works and is what makes the show what it is. Going into the second season, I expected the same thing from it, I hoped they'd keep the action and seriousness to a minimum with focus on the comedic side of the series, but boy I didn't think I'd be this wrong. In all honesty, the first two episodes of this season are the only ones which can even be remotely considered comedic and fun episodes, from the 3rd episode all the way to the very end the show becomes more action-oriented and all serious again. Once again, this doesn't mean that these episodes are bad. There are some really good stories wrapped within this serious arc that deals with the escape of a former guard captain who was imprisoned for murder. Samon's (Monkey Guard Captain) backstory, Upa/Liang's backstory and some of the past history of the prison are pretty cool. There is a decent amount of character development for Jyugo as he learns to grow out of his insecurity and confidence issues but his constant musings and the fact that he gets antagonized by certain characters during this phase can get a little annoying. At points, it also feels like the show is trying too hard to showcase this arc as something special when in reality, it's really nothing ground breaking. The battles themselves as I stated above are still cool to watch and while all these superpowers seem unbelievable, you can't deny that they're quite entertaining to watch. With all that said, the main issue during this whole action/serious oriented phase is the fact that this phase is dragged on endlessly to span over the rest of the season. This ends up as a complete contradiction to the expectations set up by the first episode - "Nanbaka is a gag anime" seems to have been completely ignored. This is not to say that there is no comedy during the main arc, there is some comic relief at points but this feels like the kind of comedy you'd find in a Battle Shonen not a 'gag' anime like Nanbaka and often this comedic relief just falls flat. As you witness this over and over again, the show starts to feel tedious and at points it feels like the series just discarded it's original identity to try and become something else. Summing up, I honestly felt the first season was much better. It had a better structure and the episodes played to the strengths of the series, the action had an element of fun to it in the form of games and competitions. Nanbaka's second season has none of this and is in a sense nothing more than what you can call an arc of an action anime which ultimately downplays the comedic strength of the series. If you liked the action oriented episodes of the first season you will probably like this season as well. However, if like me, you like Nanbaka for the comedy then you will most probably be disappointed. İts literally like 7.5 well i just voted 8 . Story is not a story we usually see and it grows like you would expect , overall it might have been boring for most people but like this kind of shows . Art like i said was colorful characters and pretty good enviroment , well basically a prison , but still was good . Sounds were unexpectedly nice especially opening and some fight musics . The second season of Nanbaka picks up right where its first season left off but I think in comparison to the first season its definitely lacking and has its flaws. Overall *probably a spoiler* the story never gets resolved in the end and instead we're left at the halfway point or even climax. In comparison to the first season's comedic interludes Nanbaka also changes drastically in tone to a more serious note, or it very much tries to. And while it still holds onto what makes Nanbaka, Nanbaka, most people will probably find the change a disconnect to what drew them in at first. While its gags are still charming, its attempt at a more serious storyline and character development seem a little more shounen cliche. And it definitely shows in the last 5 or 6 episodes of the anime where a battle seems unnecessarily drawn out. For a series so self aware, it's a little disappointing that it isn't utilized in these aspects. Art quality is still the same as the first season, but less sparkles! Which I have to say that the dedication for animating all those sparkles is amazing. The vibrant color palette continues and surprisingly works very well for some of the more serious battles and darker undertone scenes. In the animation of fighting actions, it is impressive in how some of it is choreographed in the scenes and definitely is able to show tension when needed. Also facial expressions are very well animated for the wide arrange of emotions we can actually see this season. The soundtrack is as nice as ever! Very epic sounding feel to it and definitely gives impact for fighting sequences. The catchy opening and ending continue as well. This might be a hit or miss but there is actually quite a bit of development for side characters (or everyone but Jyugo) previously introduced briefly in season 1. While the main character is definitely lacking in a well written development or even a good portrayal of why he isn't developing, the side character stories I found to pleasantly enjoyable and even surprisingly unexpected. However every scene with Jyugo and his internal struggles will definitely look neglected when compared to how everyone else is portrayed. Probably the villians are even worse off but given how little time they've appeared it's not unexpected. Despite all of that, I quite enjoy Nanbaka and its comedic aspects well enough. And I would say what pulls me thorugh Nanbaka this season is a new appreciation for the side characters and their entertaining interactions with the main cast. And when Jyugo isn't having internal monologues of self analysis it is somewhat endearing seeing how useless he is. Nanbaka is Nanbaka. You shouldn't really expect more or less and really just accept whatever it throws at you because it's probably more enjoyable that way. Nanbaka is an absolute joke of a series. What I saw in the first half of the first season was absolutely discarded for a more serious but ludicrous second part. It is non-cohesive and fails to focus on backstory and explanation. Not to mention, the comedy is pretty much nonexistent They throw in Gokuu's older brother for the sake of having an enemy. They could have made anybody the bad guy, hell, even Hajime's brother could have turned bad and it would have had the same impact. Gokuu and his brother have no chemistry when they collide, and even the main character's themselves seem to fall under this same category. As I said earlier the characters are not different enough to make them unique. Everyone collides with someone else's personality at some point. Hajime was definitely my favorite of all the characters I saw, and the Warden too. But what was up with everyone getting these weird powers? Is that like the norm or something? Is there someone that gave them all these powers or are they born with them? Like at least give us some backstory so we're not left wondering why the only thing that sets them different from each other is what they can do. Why is Jyugo basically retarded in this season?